Seller: When I Work, Inc.
© When I Work, Inc. I love how organized and efficient this app is. I’ve never experienced a work schedule app but this is def what I would expect from it. It is very good at changing availability and getting all the shifts u need seamlessly on the calendar. I can see my schedule and whom I am working with! I love it! I love When I Work it’s a great opportunity and great way to help around and also tons of money to be made and growth in the company. Not being allowed to clock in when we are “not at location“ is completely **unacceptable**. Not all of us can always be using Wi-Fi at all times, so the location accuracy is just not working OFTEN. I am at my location I’m INSIDE THE BUILDING and it’s not letting me clock in. This is my livelihood. CHANGE THIS NOW. I am logging a complaint with my bosses. Hopefully we stop using your service. I love this app! It is fast, easy and reliable. It lets me know when I work, how long I work, and what days I can't work. It's so nice to have it in your phone. I love When I Work!!! It doesn’t come much easier than this! Every part of work scheduling at your fingertips... I not only know when I work but I know when my co-workers work so switching shifts is so easy! Great app. Every scheduling manager should use it. We have only just started using this app a few weeks ago. But can already tell how valuable it will be the season! As a public golf course, we have dozens of seasonal employees and keeping the availability straight for all of the young workers we employ has always been a challenge. Plus the app is flexible enough to allow crossover of positions as many workers are trained in different to work in more than one area of the business. I used to spend days working on a schedule for the following week, and now I can put it in the hands of multiple people who can all work on the schedule the same time. I have only been on it for a few weeks but it has made life so easy! I’ve had something like this before and this works way better than the “work-day program” chipotle used. It’s very simple, & informative! This the first I have ever used this App and I love it! It is a great way to know when you have to work. All employers should use this app. Can’t get a better work schedule than this! Within 100 meters of job site and unable to clock in chill with all the updates not needed. The app is very easy to use. I run an inn and it makes scheduling seamless. I highly recommend the app. 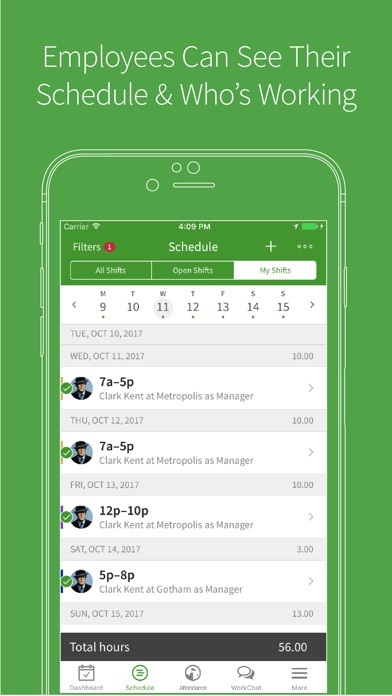 Wish you could see your schedule and shifts together without all events but app is great. Best scheduling software I have ever used. Great for both employees and management. Easy to use, great alerts, and intuitive interface. Keeps everyone in the company on the same page. The best thing since sliced bread ! Súper útil, fácil de usar. It’s an easy way to stay on top of everything at work. It’s very easy to work and very helpful. This app would be better if it displayed the full description for events entered in the annotation/title box. So when I check to see what’s going on, the words get severely cut off. If it can scroll to let me see the rest of it, that would be perfect since my managers aren’t too bright. Other than that, it’s a fairly decent app and it’s easy to operate. I love it! Easy to use ! Great for receiving our schedule and shift changes. Love the reminders for work! My boss uses this app and it’s pretty awesome. It allows me to basically set my schedule and keeps my boss up to date on my availability. When I work is the perfect app for scheduling. It’s so simple to use and even provides reminders for your next shift. Use this app. When I Work used to have the detailed summary when you clocked in/out and showed any extra notes you needed to add but now it seems after I updates it, it’s GONE. Only the summary of the total hours per week show, but I need the detailed summary. I also don’t like how I can’t change my availability anymore, and I feel like a burden having to text my boss’s personal phone about a work related topic. I do generally love this app and I choose it over many apps like this, such as HotSchedules. But pretty disappointed right now with these two being unavailable whenI know they used to be a feature on this app. Minus a few bugs and fixes that come with most apps nowadays this one is by far the best app for work I’ve ever used. It’s quick, efficient and keeps everyone responsible for their own shifts. Great way to communicate with co workers without having to personally text my cell through the built in message app and also allows for easy communication with management. As I begin to schedule employees for our 2019 farm season, I am awed by how user-friendly your app is. My crew is likewise impressed with the communication and ease of scheduling and viewing. When I work app is easy to use! I love this app! It looks nice, easy to read, font is perfect size, and it is accurate and up to date immediately! I love the ease at which I can see everyone working! If you’re like me and use you’re phone as an alarm clock, this app is great. My alarm goes off, right when I turn it off and start to think about laying around before getting ready for work, I get a notification from this app and I spring out of bed. Love this as it gives me accountability. Can’t complain. Very comprehensive and didn’t need directions to use. Great app just doesn’t always notify me like it should. I like using this app but it’s irritating because of all of the glitches. Sometimes there is a problem logging in and out. Another problem is when pulling a double, it doesn’t let you log out, then right back in. It says you have to be within so many meters of the site, but I never left the site to begin with. Other than that, I seem to have an easy time navigating. Great way to keep my busy schedule organized! This app is better then the usual clock in for businesses ! I love it and i love the Company I work for ! awesome! i love the fact that i can, view when i work, pick up days to work when i’m off! drop days if i can’t work! communicate w/both my manager & coworkers on the Chat section! extremely accurate & very up-to-date! Perfect for me and my company! Great costumer service! This application makes managing my staff so much easier. Schedule adjustments & alerts are a breeze for everyone to know right away. It’s really easy to maneuver and makes scheduling so much easier. Super useful and easy to use. Love the color coordination! Its a great app, but has way too many bugs. My boss explain to me I am responsible for doing my availability and once I do, the different departments will see which worker is available at a determine time and than they will send the notice saying I have to work the whole week or some days. When I see it I have to click CONFIRM. So far since I started I never received it. I make the observation to the team lead and she talk to the HR lady and I rcvd it only once after I told them I never rcvd it. If I recall right I think I use the app for 2 weeks. Other than that is cool the work chat. I think this is great for our busy lifestyle. Easy to use and the reminders are nice. love it! Easy to use and never had any problems. I love when I work. It’s very convenient, just go on there to see; who you’ll be working with on that day,how many hours you work, the time and day you’ll work. Most definitely easy to use, talk to your managers and coworkers. I love it and I don’t want to stop using it. I like the reminders to clock in and out. Love the app, super easy to work and lets me put in all info needed to give the boss man! I’ve used it at a couple places and it makes scheduling so easy. It’s always available especially on the days o forget my schedule o can easily pull it up in this app! I enjoy having this app! Let’s me know when I work and I can be able to accept my next weeks schedule! Sync it with your calendar and your schedule is available to alert you when there are updates or changes. Very effective way for communication with the scheduling. Thanks!! When I Work is such an easy way to know work schedules and clock in and out. I have used several scheduling applications including custom excel sheets and FileMaker database customized templates. This is by far the best solution. I have used them in several businesses for several types of scheduling needs now I am using them for my own business. Love my job and the ones I work with! Works great, easy to request days off, switch shifts etc. but my notifications for the chat feature NEVER work. I've tried turning them on and off and tried every combination of notification types but still doesn't work. Pleas fix. When I work even transfers my schedule to the calendar on my iPhone. Love it. Yes this Really works for us I love that you pick your shifts and easily submit your timeslip. Thanks when I work. When the app works it’s handy, but when it freezes it’s frustrating. I almost didn’t go to a job because of the malfunction. When I Work makes managing my payroll hours and my employee schedule between multiple locations a breeze. Saves me money managing payroll and works seamlessly with QuickBooks. Makes my life easy!! Children have my schedule on their phones, so no confusion!!! The app is very glitchy and while it gets the job done it’s just very slow, especially the work chat part and can I PLEASE suggest that you guys add a feature where you can delete old work chats with people who no longer work there! I love this app. My work uses this and it makes everything easier. No complaints!! This is right down my alley. Since the new update I am unable to do anything, but even before that I never had the option to clock in or out. I'm extremely dissatisfied with the service. The functions of the calendar are clunky and unintuitive. The phone app regularly malfunctions. My coworkers and I constantly have to go back, and revise our time sheets because of random aberrations. Tech support is of no help. This service will leave employers and employees alike disgruntled and dissatisfied. Locked out because I would not upgrade! After spending a hour developing a schedule I was asked to upgrade. When I declined, I was not able to proceed. Stuff like this shady af. Deleting the app and will not recommend to other stores in our franchise. It’s a shame because it was easy to use. I don’t like only being able to see a week at a time for “my shifts”. What’s even worse is that although it claims to sync with Google Calendar, there’s a delay of sometimes weeks before a shift appears on my google calendar, which makes the syncing pretty darn useless. The updates are great. I love that I have immediate knowledge of my schedule. It also, and I'm a manager so I find this valuable, let's me know when employees miss time punches so that updates can be made. We use this to schedule many security guards across the state. It’s accurate, easy to use and very friendly. Great job, will continue to use! Love being able to view my schedule and get real time updates right to my iPhone. Love that we have this at my job. This app is so great! But we NEED a version for Apple Watch!! Good service, very user friendly! A really easy way to change your schedule at work, I’m really glad my employer had us use it. It’s awesome. Easy to use and update regularly. Great and easy to use. Very practical and straight forward. I really enjoy when I work! Such a great app ! Its fantastic to be able to see not only my sched but my colleagues as well. Makes for super easy communication and organizarion. It’s great for employees. Big fan of having it. This app has great functionality for me as an employee. I work at an ambulance district and it’s nice to be able to see everyone else that is working through out our county. And it one of the most complete apps out there on the market. It’s so awesome, seeing your scheduled hours, receiving reminders of when you work, seeing your timesheet whenever you want being able to click in simple and easy with your phone this app allows such a modern approach to managing things like that I love it so much! If I ever got my own business I’d use when I work for sure! Very smooth app easily displaying my hours calculating the total. Able to communicate to other co workers for schedule change and request days off in advance. Can’t get much better I appreciate this app 5 star review. Love this app for work, it even reminds me before my shift and it’s just be super helpful. See title. Functionally very handy, and light years ahead of what my job was using before. My only complaint is it’s a tremendous pain trying to enter my schedule requests, when I scroll down to the date I want and the app decides to jump back to the current date. For some reason it only jumps forward, so if I entered availability requests on the 1st I’d be golden (but I can’t enter them until end of the month, so it happens every time). Also the app doesn’t update the year, but that’s probably an oversight. Took me three tries entering my January requests until I realized 2018 was still selected. Handy to have on phone! This app is extremely useful in reminding you when you have a shift approaching. It’s also great for scheduling work hours. I enjoy this app because it’s easy to navigate, updates in real time, and has some cool features like being able to see my schedule individually and with my coworkers. I think it’s a great app. Works well and keeps track of how many hours you should have. Took some time to figure out but it’s working great so far and the employees like it. Only 4 stars because of the constant pops up on the web version to upgrade. This app is a great reminder!!! Works great at our gym! No more miscommunication in scheduling. This app makes my life soooo much easier. It saves me from having to bug my boss or my coworkers with texts or emails about my schedule. I wish all my jobs would use this app! My name is Lennox I’ve been in the restaurant a month now and I love it. When I work used to be perfect and work amazingly over the summer but then all of a sudden I am not able to see who else is working at the same time as me. I know my scheduler didn’t set it like that because I am now one of the people that schedules along with my coworker. It’s just a struggle for our associates to switch shifts when there are clashes, if they can’t even see when others work. WHY DIDNT I USE THIS SOONER ?!! I love this app . I have 18 employees and it’s so easy for all new employees to use . It’s kinda of confusing at first but after you get the hang out it you honestly won’t go to anything else . Tried this app and it works perfectly for what I need it for. We have less than 15 employees, and everyone has caught on effortlessly. Notifications and reminders are a nice touch. I just started using app a couple weeks back for work. It’s been so amazing & convenient! I enjoy being able to open the app and being able to see my schedule or being able to clock in. During the last update or around them the app was changed a little and me and my coworkers were a little disgruntled. Before there were options to see just my shifts, all the shifts, and then open shifts but now I can't see who is working my shift with me. Don't like that but everything else is okay. This app really helps me know when I work and helps the owner of the company have a lot more organized schedule. The only thing I would change is to having a monthly calendar to see possible shift openings and just to have a better way to see when you work, so it’s not all crammed in:) This app is very helpful and I recommend it especially if you are on the go a lot. Easy to use from an owners end. The employees love that they can put in their requests for time off, see if it is approved. Can schedule weeks out. Many other pluses. We have used several different time clocks at work. This simplified things and makes it easy for everyone to track their hours. Super functional and practical. Easy to use and innovative! The app is easy to use. I have an iPhone sometimes it doesn’t show my hours that were confirmed the day before. I just exit and go back in. They show up then. So convenient and easy to use as well as aesthetically pleasing and navigable. I’m just returning to hourly work after nine years, and this app is MUCH quicker and better than logging into the old Hotschedules site online. I love being able to change my availability so easily AND that it lets me see not just my shifts but all/everyone’s shifts, regardless of whether my coworkers have released them or not. Been using this app for over 3 years now and had no problems until recently. This app has kicked out our employees twice now within two weeks. We’ve had to manually put in all of our employees all at once just for it to kick out everyone again. Schedules completely deleted. This app makes clocking in and out a breeze (you can do it anywhere, and it reminds you). And it keeps track of shifts, and allows easy communication with coworkers. I highly recommend it. Overall this app has been awesome for my job, the only issues I have is with the group chat. It takes forever to load them long with not sending messages at all. It’s very inconvenient as it’s just easier to text my coworkers/managers instead of bothering with the group chat. Sometimes notifications also do not come through. The group messaging needs and overall but besides that the app is awesome! I hope that some day it will be available for my Apple Watch. Great way to stay update on your work schedule! Great App, works as advertised and does just what I need it to do for my small business. Two thumbs up! 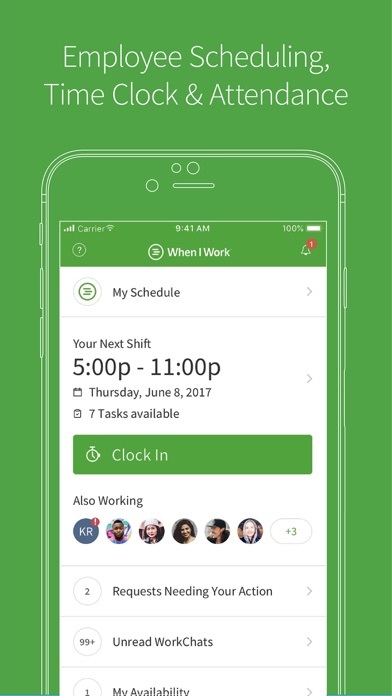 The app is definitely helpful with managing a schedule and swapping shifts and managing availability’s and requests off but there is a HUGE DELAY in information processing. Management will approve a shift and half hour to a couple hrs later it appears. There’s no manual refresh that I’ve been able to do to have it work. Please fix your app for instant updates and notifications. Love the schedule at my fingertips. I like some aspects of it better than 7 Shifts. I like the flexibility and the notifications are very helpful to remind me of my schedule and when I’m available. Easy to communicate, notifies you when you have to work, and applies easy switching of shifts if needed. I love it! Loving using it so far! This app keeps work scheduling very user friendly and everybody on the same page:) perfect!!! Very simple and uncomplicated. I see no need for improvement. I’m a big fan of this app. The only thing I would improve would be the schedule calendar format. I would love to be able to switch to a daily/weekly/monthly view instead of just weekly. This app is great when it works. It’s very iff-y for my whole crew. It either won’t send me notifications or it won Tyler me sign in on the chat feature so I can communicate with other co-workers. Every employer should have this App! I wish I could get these same people who created this app, create some software for my business. They thought of everything and this app is flawless. So easy, love the reminders. I like seeing my schedule as well as my coworkers schedules. Everything I need to know in one place. Simultaneously communicates to supervisor and coworkers. Very well set up. Easy, to navigate. Life saver! App works great, fluent with web ui. Use it for my biz. Excellent! So far, I have yet to have any issues with it and I’ve been using it for about a month now. Very helpful! I love it except when my manager posted open shifts I couldn’t see them on the app until after they were filled. I refreshed and restarted the app multiple times but they wouldn’t load. Would be nice if you could clock in and out even when you are not scheduled for a shift. Such a great application for managing my availability and my work schedule. I like this app. scheduling is easy and it syncs with my calendar. one thing to make it perfect is have an alert 5 to 1 minute before or when shift starts. i don’t get having alerts only one hour or more. you’ll forget by the time your shift starts. please have a start work now alert. Quick and easy. Routinely in communication with my job. Works for me. quick learning curve, easy to use, and super helpful to have !! This is the best clock in/work schedule system I’ve ever used! I wish every business used this app. It’s made my life so much easier. I don’t have to go anywhere to look at a schedule or clock in. I just do everything right here with my phone. Perfect for small businesses and employees. It takes a bit of getting used to, but after you've played around with it a bit the app is easy to use and very helpful! Great scheduling tool for work!! I love how easy this app is to use, it's very easy to use and I haven't had any issues with it! The update has made the app basically not at all useful for me to use. The best thing about it was that you could view who was working at certain locations, instead of all locations. My workplace has 14 locations, it's not at all useful if I can see every single person working that day. I love this new update except for one thing. I dislike that the schedule automatically shows the schedules of both locations. With the old version you could decide which you location you wanted to view or you could view both. Most of the time I only want to see one location and you can't do that on mobile anymore. This app is stupid. It always logs me out at random and doesn’t allow me to log back in so i have to reset my password. Dumbest app ever!!! This app is great, but since updating, it constantly logs me out now. When I first log in, I see my schedule, and I attempt to click another tab and it brings to me to a screen that asks me to add my workplace. This screen doesn’t allow you to do anything but log out or add a workplace that you’re not authorized to add, so you have to close your app and reopen it, and login again. Thank you for the constant improvements to the mobile features, the last few have eliminated many thumb swipes, keep up the good work. Don’t like the new update! Thumbs down! If it’s not broken don’t fix it! App was good but now it keeps going to find my work place and forcing me to sign in. Not sure I can use until it’s fixed. I love this app, but ever since the update, it keeps crashing. I open it, it crashes/closes. I open it again, same thing. By the third or fourth time, it will stay open. Love the app, but, the new update is not stable. It has crashed a few times on me and it makes me re-login everyday. This app was working well but with a new update has since been rather frustrating. Each time I start up the app in iOS it connects me to the system and then 5 to 10 seconds later kicks me out of my workplace. I then have to restart the app and re-login every time. Very helpful for staff scheduling and timeclocking. Had a crashing issue after Oct 18 update - but a remove and reinstall fixed that. The recent update has made it difficult to access my schedule, it crashes by asking for my account Id or address, if I go back it then kicks me out forcing me to log in every time I want to see one shift at a time. App is now blocked by Find my Workplace. I have been using this app for a couple of years, but will have to find a new one if this is not fixed soon. Ever since I installed the new update I have had this problem. I open the app for the first time since the new update and it works like normal. The next time I open the app it sends me to a page that says Find My Workplace. The only options it gives me are to input my workplace or to logout, I can’t go back to my schedule. In order for me to access my schedule again I have to close the app reopen it and sign back in. Before none of this happens and it is very frustrating to have to do this every time. iPhone SE. Will update review after it's fixed. This app keeps getting better and better. As others have already stated, there are no audible alerts when using work chat. This makes this feature nearly useless as you constantly miss messages. It keeps track of my hours I work, eyy, that's pretty good. I've had zero negative issues with the app; it works just as it should :) I quickly check my schedule and chat with coworkers. Side note: I would love an alert option for chats! This app is user-friendly, as many reviewers have said, but it crashes way too much and is extremely slow. Usually takes several minutes and at least one crash before I can even look at the schedule or see chats. I've spoken to several coworkers and this is the case for them as well. Great app, user-friendly and helpful. It’s a great app never wondering when u work!!! When I work keeps me organized for work. I like it a lot so I know when I work and I can see the schedule and so much more. It's just a little confusing to use sometimes but you get the hang of it and learn. It should have like directions or something. Otherwise, I love the app! I’ll rate it a A five star . It’s good scheduling! This app is so easy to use! I don’t know how I ever did without it! From shift alerts to chat messages, this thing does it all! Great all in one app for a restaurant! Super great! Only thing I would add is a contacts section so we can easily contact each other when we need shift trade/coverage. Some people don't check/use the work chat and need to be contacted via text. This is a great way to make schedules and gives my employees the ability to see their times online. Very convenient for time off requests. Also scheduling is very easy & very efficient for getting shifts covered last minute! I love how organized I feel when I know what’s going on at work! Super awesome app! Very convenient! Easy and convenient. I don’t have to worry about if I forgot my schedule, because it’s conveniently on my phone. Although I love my job and so generally don’t need reminders, when life gets crazy busy it helps to keep me in check. This is the new way of working, I love it. Our small company - 7 Employees- finds it easy to navigate as well as make changes, accept shifts, communicate, etc. using this app. 5/5 Stars from us! I can’t see my schedule!!! I have tried to get in contact with the makers of the app. My company made us download this app to clock in it doesn’t show when Im scheduled or anything the only thing it shows is an old conversation for December 12 and it sends me text saying I missed clock in. I need this fixed cause it could threaten my job!!!!! Really appreciate this app. I use it every day to schedule and communicate with 8 teammates. We provide 24 dementia care. The app keep getting smoother. Sometimes I have to go to my desktop to fix something that the mobile won’t do. But the carry over to the phone is good. We have just started using this app through my catering employers… It looks like it’s going to work out very well! Very useful tool to help keep employees and work organized. The only way the app can be any easier to use is if you only had to talk to your phone to get it to do everything for you. Definitely will recommend this to other business owners and managers. 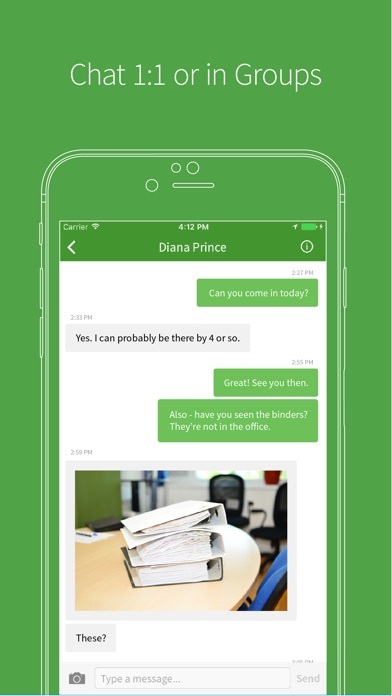 This is a great app to keep in contact with everyone working for the same company as you. I love having my schedule at my fingertips! I use this app to schedule 20+ employees in a taproom of a brewery. The ability to change shift as you go, update the schedule, approve/deny RTOs, and so forth is so easy and convenient keeping everything together. Love it! This app is amazing it allows you to see everyone’s shift and also interact with your co workers! Great way to track everything from schedule to hours worked and availability. I really enjoy using this app because it helps me make certain updates to my work schedule. That way I can communicate with my co workers to tell them whether or not I’m available to work if there are some last minute changes. Overall, I give this a 5 out of 5 because it’s a faster version on the phone rather than using the computer. I like that the app connects to my calendar that I share with my wife. Great app,, keeps you updated on changes and scheduling . Great, easy to use = easy to plan for the month! Love it! This app is great, convenient, and reliable. It has everything I need to have in order to communicate with staff, schedule hours and update my coworkers. Easy to use also! I purchased this app for my business of 10 employees (I’m the owner) making 11 users including me (not an employee). The plan ask how many employees I have, I said 10. I’m paying $168 a year for 10 employees. Here’s the kicker, to add my tenth employee I have to pay $166 more because it counts me as an employee. On the plan it says unlimited users, at $1.40 per employee, don’t believe it!!! It’s in increments of 10 and you count as one! It’s not user friendly as well. The dashboard doesn’t give you a clear way of navigating the app. You have to dig around to find the employee list and if you need to make changes to an employee, you have to delete them then add them again. It is not worth the money. Use the Crew App, much better and easy to navigate. This is the 3rd time I’ve had to delete and download the app again. It will change my schedule and not show me all of the shifts I’m scheduled to work for the current week. Very frustrating and caused a conflict with holiday time with my family. I can’t create a new account. I can’t use the app if I can’t get signed up. Great app to check for my schedule. Even put in request for for days off. It works how it was designed and I am cool with that. This app is so easy to use! So I’m not finding the availability section on my app. I need to be able to change my availability so I don’t get conflicted scheduling. So easy to use and very convenient! This app has saved us so much time and worry. Our staff loves being able to access schedule information straight from their phones. When I Work has not only be come my one stop shop for any and all scheduling but has brought the business I work for to new age technology for penny’s a person. I thank this company for there hard work. Also I would recommend this to everyone. I deal with Firefighters and this is amazing for them with moving around. Very organized work app that keeps me on track for when I am responsible for going into work. 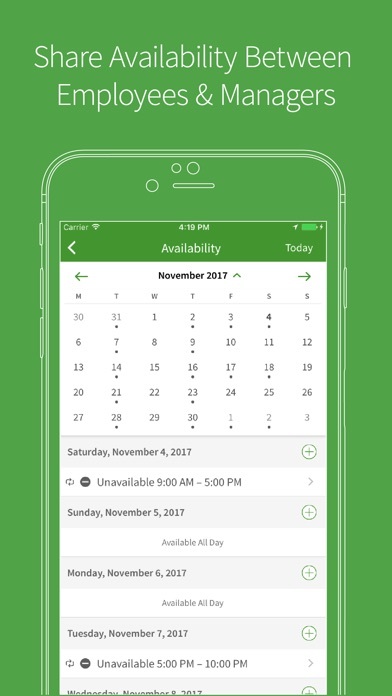 Also communicating with other coworkers and requesting off days can be easily done with this app. I love it!! 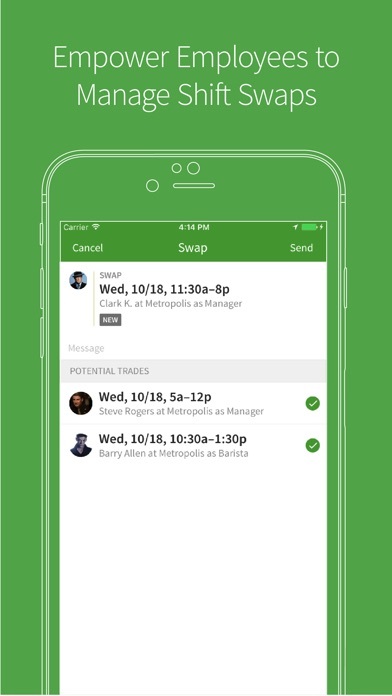 The app adds continuity to scheduling. It’s awesome for start ups. However, I wish you could AT LEAST schedule for two weeks without an up charge. Excellent and exactly what my business needed! When I work is a super functional and user friendly app for the employee! Almost great. Had to see locations when choosing a shift. But great. Recently downloaded this app for my new job. I like the features. But there’s a weird glitch, my schedule posts and then it only shows one of my shifts, even though there are 4 confirmed on the schedule. Website works half way. App doesn’t. This app consistently notifies me that I have forgotten to clock in for a shift when I already have clocked in. The screen that pops up to “confirm shifts” prevents me from clocking in quickly and seems unnecessary. Just let me clock and and stop telling me I missed my clock in when I haven’t.